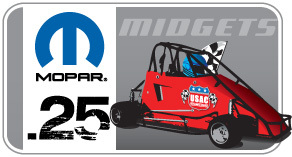 REGISTRATION OPENS FOR 2010 "BATTLE AT THE BRICKYARD"
Registration has opened for the 2nd Annual July 6-10 USAC Mopar .25 Midget "Battle at the Brickyard" and participants can enter online at http://www.usacracing.com/quarter_midgets/brick_battle. A record field of entries is expected for the event, held in the infield near the Garage Area in the shadow of the famed oval's Pagoda. Registration is open first to those who have participated in the district "qualifying" events at Metro Atlanta in Georgia, Orange Show in California and this weekend events at Kokomo, Indiana. To reserve their spot at Indy, registration must be completed by June 21. After June 21, additional USAC members who have participated this season may enter, as well as any participants electing to join USAC prior to entry. A total of 137 different drivers participated in the Metro Atlanta and Orange Show district "qualifiers" and more are expected to earn invitations this weekend at Kokomo. Seven different states were represented in victory lane at last year's Inaugural "Battle at the Brickyard." Champions in 2009 included Ohio's Garrett Ottman (Junior Rookie), Mox Price (Junior Honda), Ross Rankine (Senior Honda), Frankie Nervo (Light 160) and Ryan Fleming (Heavy B and Heavy AA); Michigan's Logan Wennesheimer (Junior Stock), Cannon Konzer (Heavy 160 & Heavy World Formula) and Dean Creech (Half); Indiana's Miranda Beighler (Senior Rookie), Gage Walker (Light World Formula) and Zachary Hampton (Light B); Florida's Braden Nash (Junior Rookie), Illinois' Mike Gass (Heavy Honda), California's Brayden Trigueiro (Senior Stock) and New York's Brendon Bock (Mod/Light AA). For more information on the event visit usacracing.com or call 317-247-5151.